promotes wine from the eastern United States. Established in 1973 as the Vinifera Wine Growers Association (VWGA), we continue to advocate for planting world-class vinifera wine grapes and quality hybrid and native varietals, producing outstanding commercial wines, and growing a thriving wine industry along the eastern seaboard. 2018 Wine Competition Congratulations CrossKeys Vineyards for BEST of SHOW Fiore 2017! 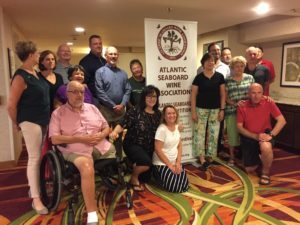 The Atlantic Seaboard Wine Association promotes American wine produced in the seventeen eastern states: all those that touch the Atlantic Ocean plus West Virginia, Pennsylvania and Vermont. We are a trade organization founded in 1973 as the Vinifera Wine Growers Association, renamed in 2008 to reflect our expanded regional focus. To help identify the best of the best, ASWA holds an annual wine competition, the largest in the nation focused exclusively on the wines of the East Coast. The competition is held in late summer and judged by a panel of professionals hailing from all parts of the country.